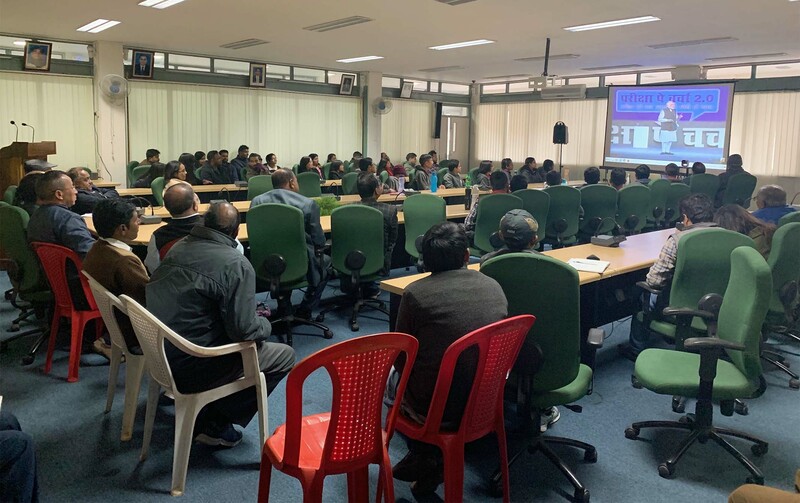 Students, teachers, staff of North-Eastern Hill University, Shillong joined the rest of the country in taking part in the interactive programme “Pariksha Pe Charcha 2.0” on January 29, 2019 at 11 am. Students of NEHU, research scholars and students from Kendriya Vidyalaya, NEHU along with the Pro-Vice Chancellor, Prof. H. Lamin, Registrar, Dr. J.N. Nayak, Finance Officer, Shri. L.M.K, Lyngrah, Deans of various Schools, teachers and staff witnessed via live video conferencing a lively and thought-provoking interaction between the Hon’ble Prime Minister, Shri. Narendra Modi with the students, teachers and parents at Talkatora Stadium, New Delhi. The programme also witnessed the participation of foreign countries like Russia, Nigeria, Oman, Doha, Saudi Arabia, Singapore, Kuwait and Nepal. The programme began with a colouful dance performance from students in different costumes depicting different states as well as a performance from the differently disabled. After a welcome speech by Hon’ble Union Minister, Ministry of Human Resource Development (MHRD), Shri. Prakash Javadekar, the Hon’ble Prime Minister started taking questions from parents, teachers and students which ranged from dealing with exam stress to the dangers of depression, all of which were replied by the Prime Minister.